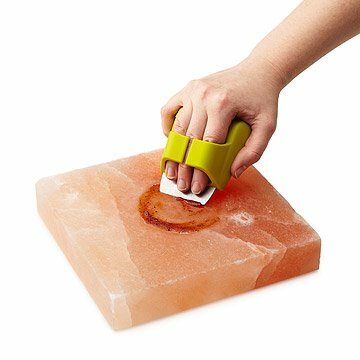 This handy tool is designed to keep your Himalayan salt plank clean. Keep your Himalayan salt plank in prime condition for grilling and serving with this specially designed cleaning tool. The handheld scrubber has nylon bristles to gently clean the plank's surface, and a stainless steel blade to remove baked-on residue and keep your plank presentable. This essential accessory comfortably conforms to your hand, is easy to use, and is small enough to store in your kitchen gadget drawer. It makes a great gift for Father's Day, or for a foodie couple, with or without a new salt plank. Made in China. Pair your Himalayan Salt Plank Scrubber Brush with our Himalayan Salt BBQ Plank. I got this to go with a salt plank I bought my husband for Christmas. It works well enough, but can't remove everything, even with him scrubbing pretty hard for a few minutes. While it would be nice to be able to have it cleaner-looking, the plank is salt, so I'm not afraid of bacteria growing, and it's definitely better than any other option I could find. Yes, when buy more salt planks, gifts and myself. No worries about cleanup or doing it wrong. Good to pair with the salt plank. It's literally exactly what it is. Made to go with the salt plank for cleaning. Since salt planks are kind of odd, I figured I'd make it easy for my dad to clean his. Im definitely buying this product again! I bought this as a gift for my mom and I really wanted to know how she likes it so I could buy one for myself and she loves it! So I'm definitely ordering one soon! This is a very good quality heavy stone. Purchased as a gift for my father in law. He loved it. Great cleaning tool to maintain my Himalayan Salt Plank in top condition. Love using our salt block but it was difficult to clean properly. This product is ideal for scrubbing the block after each use. We gave this to my brother-in-law who is a budding cook. He had never heard of this tool, so was excited / intrigued to use it. Awesome to purchase this to go with salt blocks to help them last a long time!